Five years later, countless EPs and splits in between two full-lengths, Satanic Warmaster returns with Nachzehrer. With what becomes almost traditional black & white cover art and Satanic Tyrant Werwolf now handling everything himself, the album is a full-on success because it is, oddly or not, exactly what you expect it to be. Just like the Intro with its 2 min of beast growling and tossing in Gehenna would be ridiculous everywhere else, it is very much at home on Nachzehrer, the fine display of raw primitive and bestial black metal. As if possessed by this album in the last couple of weeks, I have tried playing songs and excerpts from the album to some of my family and friends who displayed a profound disdain for anything black in the past. The essence of my appeal – as low-fi production as Nachzehrer is, its few-track analog recording sounding purposefully unpolished yet booming, how can you not get charged with energy in the face of this gritty and vitriolic, yet so catchy, display of power. Got a few enemies to mow, Nachzehrer is a perfect soundtrack to get ready. Predictably, I got a lot of weird looks from my friends preferring much more polished displays of music. Call it elitist, if you want, I was so proud and privileged to sit there alone in my car, truly “get it”, while playing the album on repeat. Buzzed up by mid-speed tremolo, the faster songs on Nachzehrer have the groove of a beehive on the hunt. Shifting the tempo craftily from blasts to Hellhammer/Horna thrash, Satanic Warmaster is not afraid to produce pieces which are strangely melodic. Punctuated by timely drum rolls and cymbals crashes, only deaf can’t hear this melodicism on sinister Satan’s Werewolf, triumphant Warmaster Returns and strongest compositionally One Shining Star. If anything, the latter track is drenched in melody, while still remaining graciously nihilistic. 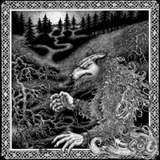 Warmaster Returns sets out with a Nordic folk riff and becomes a mid-album manifesto, vibrant and brimming with pride, discharging tremolo note after tremolo note with the closing solo tubed out and careening out of control. Slower songs, Vampires and Rotting Raven’s Blood, emphasize the might of Nachzehrer active rhythm section, Vampires going on the Celtic Frost bend and Rotting Raven’s Blood stuck in older Darkthrone muck. Primitive production on Nachzehrer does not mean lacking details. One Shining Star has just the right touch of synth and Bestial Darkness opens with a weird spooky organ, before becoming bombastic and pretentious, while being wholly penetrating despite some very basic riffs. The closer Utug-Hul is a trip to the land of Summoning, showing the depth and direction where Satanic Warmaster may go next. Nachzehrer is one album where meeting expectations and being predictable is exactly what the doctor ordered after lurking in the background for Satanic Warmaster. Just like with Armour, Satanic Tyrant Werwolf shows that he can put together masterful riffs, and if you have an uncanny ability to write those they, the believers, will always come. PS. Deluxe picture LP is released in November 2013 on Hells Headbangers.